Cook grilled-to-perfection ball park quality hot dogs at home. Ever wonder why hot dogs always taste the best at ball games, carnivals and fairs? It's the way they're cooked! 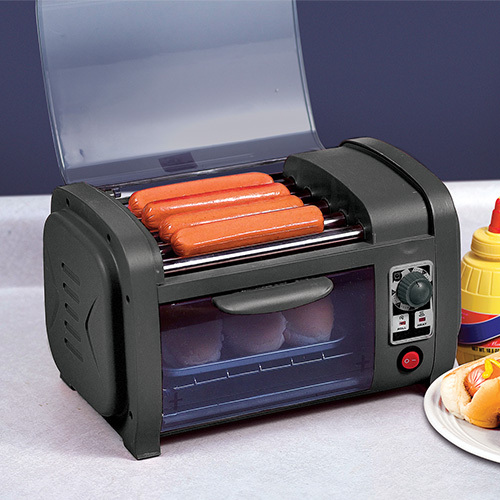 Bite into a hot dog or brat prepared with this quality hot dog oven and toaster and you'll be in hot dog heaven. The stainless steel motorized rollers grill hot dogs/brats evenly all the way around for perfection in just 8 minutes (12 minutes for frozen). Pop the buns in the toaster oven below and they're warm and toasted for that one-of-a-kind taste. 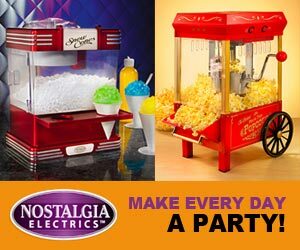 Features 210 total watts of power, auto thermostat, timer, removable tray under rollers for easy cleanup, see through oven door and compact design that's just 12.5" x 7" x 7.5". Dishwasher safe parts. Dimensions 12.5" x 7" x 7.5"